From slab-like, utilitarian smartphones like the Nokia 3 (first impressions) and Nokia 5 (first impressions) to a much polished Nokia 8 Sirocco (review), the yesteryear’s brand has come a long way under the aegis of HMD Global. But amidst all these launches, one smartphone that everyone has been looking forward to is the Nokia 9. Expected to be the brand’s flagship offering, the device has been in the rumour mill for over an year. 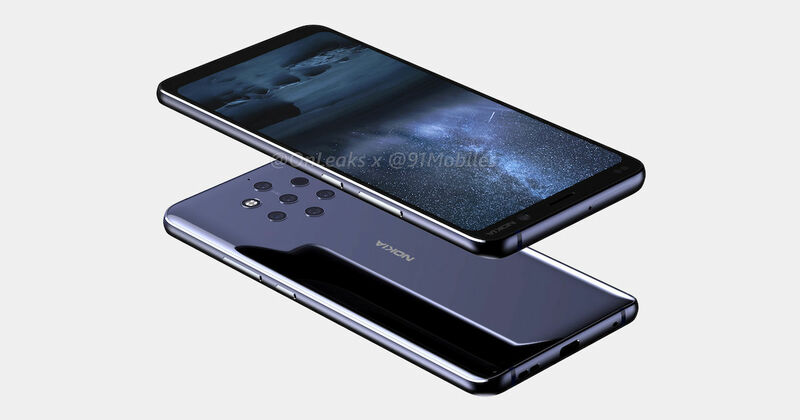 However, it now seems that the Nokia 9 PureView’s launch is closer than ever as recent rumours and speculations suggest. So if you are impatiently waiting for the handset, and want to know what all it could bring to the table, here’s everything that you need to know. Ever since the rumour of Nokia 9’s camera setup broke out, it has been the hottest topic on the Internet. Notably, the upcoming flagship will be the world’s first-ever smartphone to come with a total of five cameras on the rear panel with sensors from Zeiss Optics. While the actual details of these snappers are not known, it’s being speculated that the module will have a telephoto lens, a wide-angle lens, and a depth-sensing camera, among others. A leaked promotional video in the past has given us an insight into the features of the penta-cam setup. The cameras are capable of capturing five simultaneous pictures to capture 10 times more light for enhanced photos in the low light. Users can also adjust the focus of images after they have been captured. In November last year, 91mobiles, revealed the 5K renders and 360-degree video of the upcoming phone and if they are of any indication, we can expect the Nokia 9 PureView to be one of the better-looking flagships from the brand’s stables. The rumours suggest that the smartphone will come with a glass-sandwich design with a slightly curved rear panel and Gorilla Glass on both the front and back. The smartphone is expected to come with a 5.9-inch display with QHD resolution and 18:9 aspect ratio. There are speculations that Nokia 9 PureView could also be the first from the brand to come with an under-display fingerprint scanner. Unfortunately, the 3.5mm audio socket that was ditched on the Nokia 8 Sirocco will likely be missing from the upcoming flagship as well. While Nokia is known more for its affordable and mid-range smartphones, its flagship offerings can easily match other high-end devices toe-to-toe. The same is expected to be the case with the forthcoming Nokia 9 PureView. According to the rumours, the flagship will come equipped with the Qualcomm Snapdragon 845 processor, aided by up to 8GB of RAM and 128GB of storage. Further, the phone is expected to be powered by a beefy 4,150mAh battery. Since HMD Global has announced that all its smartphones will be Android One offerings, the Nokia 9 PureView can also be expected to be the part of the same. The upcoming handset is likely to boot the latest Android 9.0 Pie out of the box. This means that along with a bloat-free and cleaner UI, the Nokia 9 PureView will receive two more major updates including the Android Q. Additionally, the smartphone will receive three years of month security patches from Google. There have been several rumours in the past regarding the launch date of the Nokia 9 PureView. A more recent report suggests that HMD Global will launch the phone globally by the end of January 2019. The global launch of the handset will be followed by India launch in February. However, another report suggests that we’ll get to see the Nokia flagship at MWC next month. Irrespective, we hopefully won’t have to wait for long to see the Nokia 9. As for the pricing, the flagship is rumoured to be the most expensive Nokia offering to date. If a recent leak is to be believed, the smartphone will be priced around Rs 65,000.